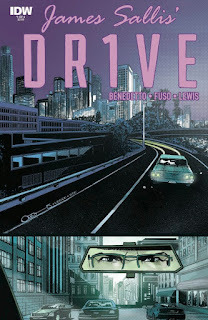 The Fellowship was fortunate enough to obtain a copy of DRIVE #1 from IDW Publishing. Michael Benedetto writes, Antonio Fuso and Emilio Lecce draw, and Jason Lewis colors. He drives. It’s what he does, it’s who he is. He takes it very seriously; if he’s going to do it, he’s going to do it well. But stunt driving in the movies doesn’t really pay much, so he takes side jobs that are sometimes, um, legally questionable. The current job is to drive for a small group who are knocking off a pawn shop that does most of its business through the back door. But the take from this job is way more than anyone bargained for. This series is adapted from the popular James Sallis novel (which was also a movie, by the way). Driver is not the most charismatic fellow, but he has his moments of humanity in this story. And it takes a classic crime situation and adds some interesting twists. This first issue is well constructed, too, with good characterization and a great cliffhanger. And the art has some great action moments, and focuses on the cars as strongly as you’d expect Driver himself to do. So maybe Los Angeles is not all glitz and glam. Bad things happen there, too. This is that kind of story, and it’s a really good one. DRIVE #1 is available now at your FLCS or at idwpublishing.com.